Our ground-breaking Mend Our Mountains project has entered an exciting new phase after work got underway in one of the eight national parks that will benefit from the almost £104,000 raised through generous donations. It was the BMC’s biggest campaign to date, and the most successful crowdfunding appeal for upland path repairs ever. And now our ground-breaking Mend Our Mountains project has entered an exciting new phase. Practical work on one of the eight projects directly funded by the campaign got underway on a remote path near Long Chains Combe in Exmoor National Park. 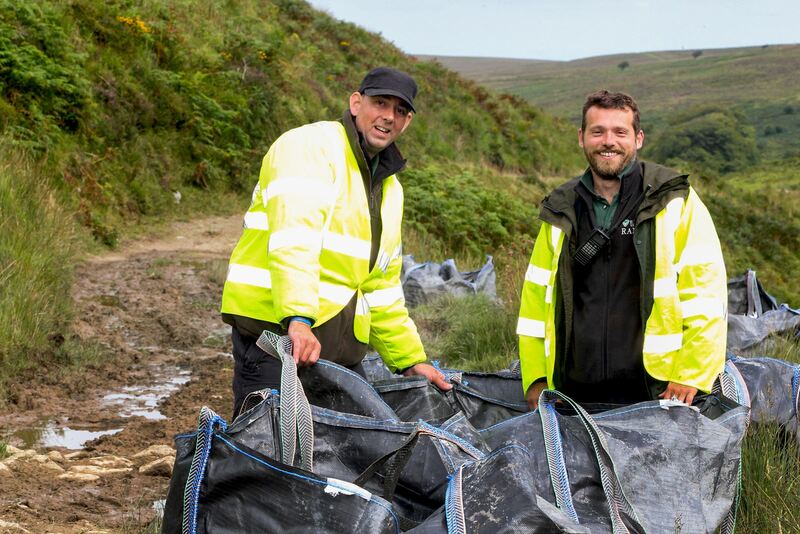 For Exmoor, the aim of the project was to raise enough money to airlift stone onto the moor to improve the surface of the important Two Moors Way, a 102 mile route which celebrates its 40th anniversary this year. The Mend Our Mountains campaign raised £7,500 for this work, out of a total of £103,832. Sue Applegate, Rights of Way & Access Officer at Exmoor National Park said: “We were surprised and delighted at the amount of money we raised by this innovative project which will enable us to improve the surface of an ancient route, one of Exmoor’s most remote and rugged tracks. 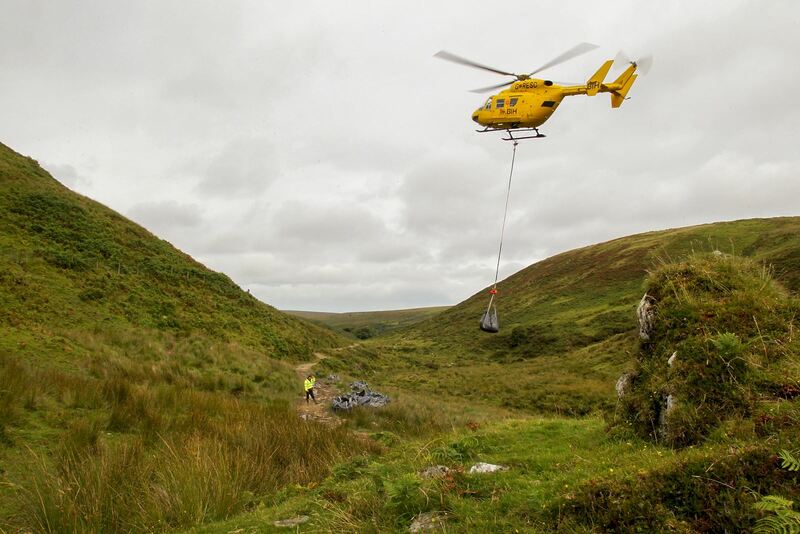 “To repair a path we would normally use material that is on site but in this case there was simply not enough suitable material for the scale of the job - because of its remote location a helicopter was the most efficient way of getting it there. The work would probably not have been able to go ahead without this funding and we are really grateful to everyone that donated from all over the UK and even as far away as the USA. “We are also grateful to local businesses XMAN Events and Encounter Walking Holidays for donating rewards as well as the staff from BIH (Onshore) Ltd and local contractor Steve Atkins who worked with our National Park Rangers to lift the stone in. 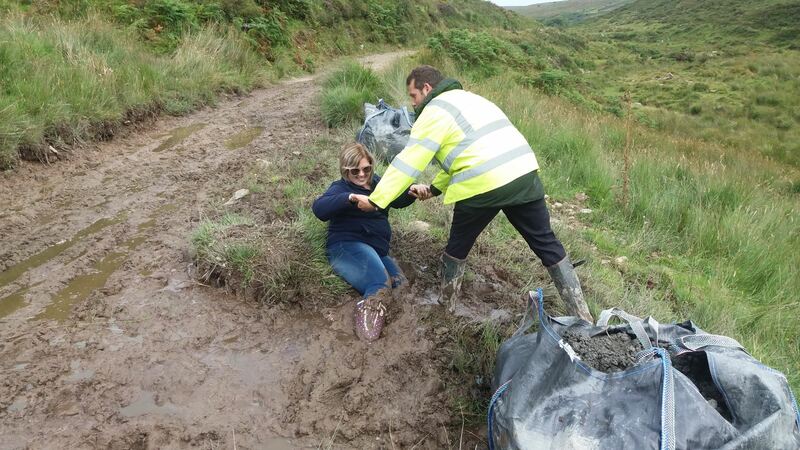 As if to illustrate the point on the day of the helicopter rock drop, Heather Glendinning from BIH (Onshore) Ltd ended up falling into deep mud on a section of path that currently resembles a swamp! And Carey Davies, BMC Hill Walking Development Officer, says recent and significant rainfall in the area has only added to the problems of erosion. He said: “We are thrilled to be able to support restoration work near Long Chains Combe with proceeds from the BMC’s Mend Our Mountains campaign. “This work is happening because thousands of walkers and lovers of the outdoor landscape of Britain came together to make it happen. “Mend Our Mountains was a massive crowdfunding campaign which raised almost £104,000 in total for eight path repair projects in some of the most popular and iconic upland landscapes in Britain. It was a real 'community' effort, with lots of different elements of our 'outdoor world' pulling together for a cause and being involved in different ways. “It is great to be able to include this beautiful Exmoor location as one of the supported projects. Exmoor contains some of the most awe-inspiring and entrancing landscapes in Britain. “The Exmoor coastline is rightly famous among walkers and climbers, where picturesque villages nestle among these breathtakingly huge coastal cliffs. But the inland landscapes are wonderful too, like The Chains, where the atmosphere of older eras is preserved among tightly-wound valleys and moors dotted with ancient stone circles like the ones at Long Chains Combe. “Everyone should be free to explore the British outdoors, but the accumulated impact of walkers does take a toll, which you can see here. The Chains also gets a lot of rain, and in the past has experienced some of the highest daily rainfall Britain has ever seen, which exacerbates the problem of erosion. The repairs to the path will now begin in earnest so that a reliable, dry route is in place before the autumn. The Mend Our Mountains campaign will also fund repairs to damaged paths on Snowdon, Scafell Pike, Ingleborough, Kinder Scout, part of the Brecon Beacons Horseshoe, as well as contribute towards vital repairs to moorland on Dartmoor and the North York Moors. The campaign, which launched on 14 March, got off to a flying start with £22,000 raised in the first week. Pledgers were able to bag some fantastic rewards including days out with outdoor experts and celebs including top climber Steve McClure and comedian Ed Byrne. Meanwhile Catherine Flitcroft, the BMC’s Access and Conservation Officer, urged those still keen to donate to carry on doing so. She adds: “Over the past few years, the BMC has helped fund numerous path repair works across England and Wales, through our charitable arm, the Access & Conservation Trust (ACT). “For instance, path repair work in the Lakes on the Scafell Pike plateau and Dale Head, part of the Wainwright Coast to Coast walk in the North Pennines and upland footpath restoration work at the Roaches, Staffordshire, along with various sections of path in the Yorkshire Dales which see heavy footfall as a result of the Yorkshire Three Peaks. 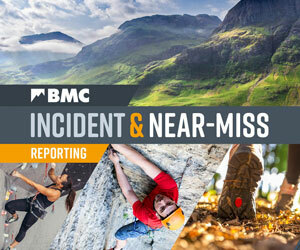 “Spurred on by earlier path repair projects, increasing visitor numbers to our national parks and smaller budgets, compounded by the extensive damage of recent flooding, the BMC launched the Mend our Mountains campaign to try and raise much needed funds to repair well-trodden paths in popular mountain and moorland areas, kick-started by a generous donation from ACT.